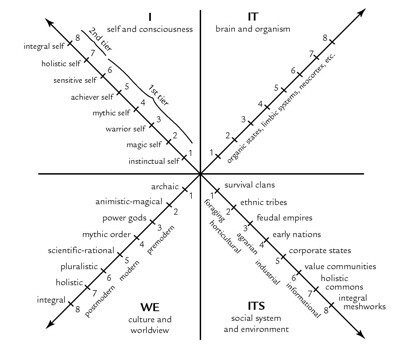 Starting with the ideas of Integral theory, it is possible to arrive at the Zodiac, by combining the Integral Quadrants with three levels of worldview. A 5000 year old system based on observation of the seasons, just happens to align with some of the most up-to-date theories of human development. This part of my ongoing quest to understand different maps of change. I fell into exploring the Zodiac as part of a university statistics project 20 years ago. I found that what I thought was a random superstition was very carefully structured, and contained a lot of useful ideas about human conscious evolution. I’ve kept coming back to it over the years — especially when I find systems that define 12 parts to a whole. 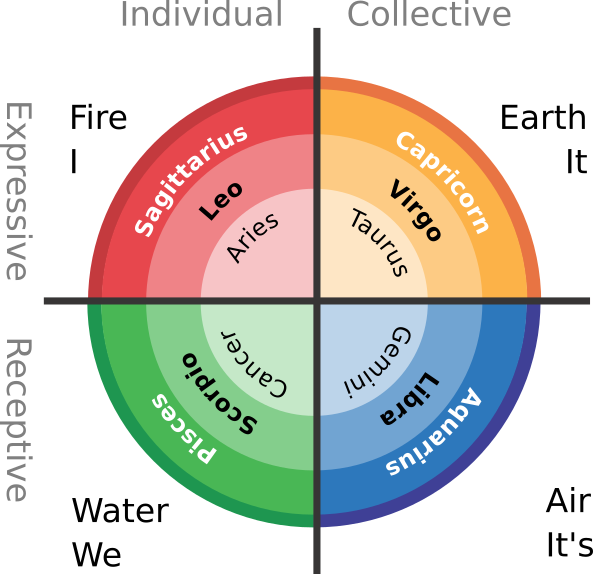 When I found integral theory’s 4 quadrants and 3 Levels, I very quickly looked at how they mapped onto the Zodiac. This is a summary of what I found. There are always going to be issues and mismatches when trying to unify or compare systems. Cross-referencing different models in the search for different perspectives however can provide some valuable insights. This is an early release of my explorations. There is much to refine, and many ideas to finish. A more refined version will follow, eventually. Please don’t just turn off because this mentions Astrology. The Zodiac is a system that maps how the seasons change. It has arisen over thousands of years to classify the types of changes that take place from spring through the seasons. There is no need to believe that the stars have any influence on your lives. If you’re sceptical, take a few moments to suspend your disbelief. Just accept the possibility that continued refinement over a few thousand years could produce an underlying set of ideas that has some kind of validity. Even if you struggle with that, let it just be handy naming system that just happens to neatly emerge from a basic set of rules. I had Ken Wilbur’s Theory of Everything sitting in my bookshelf, half read for many years. After reading Laloux’s Reinventing Organisations, I picked it up again and found that my thinking had changed over the years, and the book suddenly felt like light reading, allowing my to integrate many of my different explorations over the years. 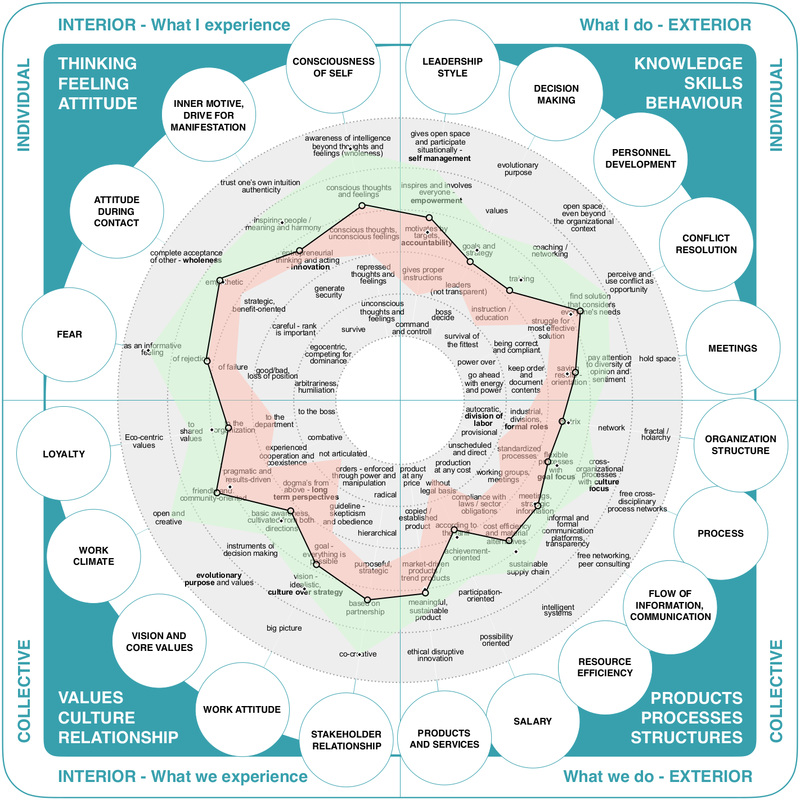 The book also filled in some of my understanding of the Spiral Dynamics theory that underpinned Laloux’s idea of “teal” organisations. The foundation of Wilbur’s Theory of Everything was the four quadrants. These quadrants describe different perspectives on the world. Wilber mapped the different levels of Spiral Dynamics onto the quadrants, showing how the levels were expressed. 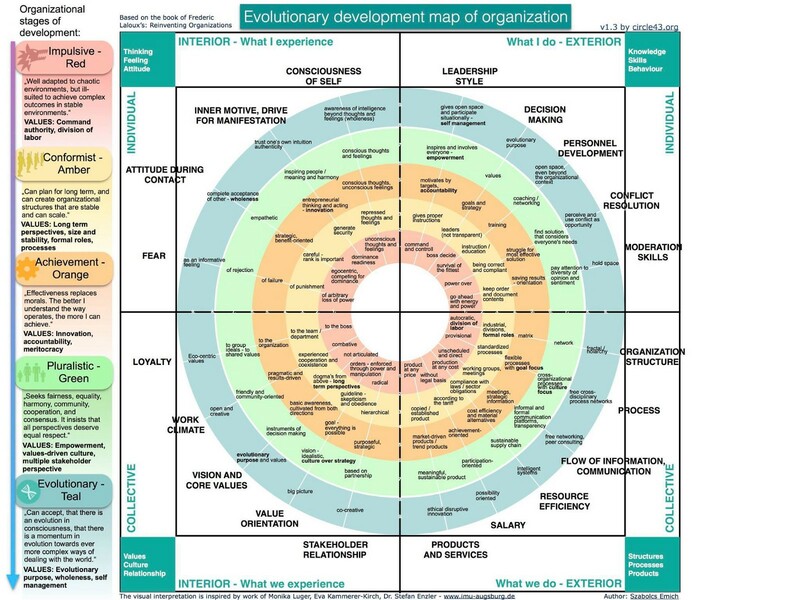 This combination of maps is the All Quadrants — All Levels (AQ/AL) view. It is a very handy tool that makes it possible to find real, practical applications of the theories. My explorations of the Zodiac and Integral theory begins with the Quadrants. 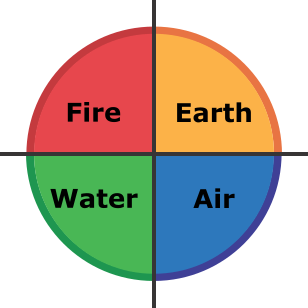 The basic Integral quadrants map very neatly onto my interpretation of the four classical elements: fire, earth, air and water. Versions of the four elements exist in almost every culture on earth. They are amazingly universal because they describe the universe from a subjective, experiential, perspective. 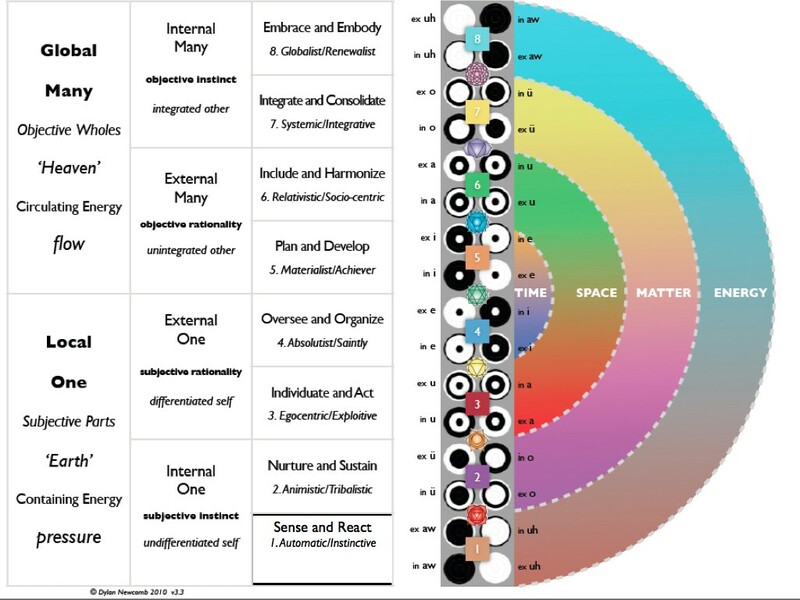 These elements are the basis of all sorts of classical philosophy, and although they may not directly reflect the physical world, the system is very effective at describing elementary properties of a perceived world. 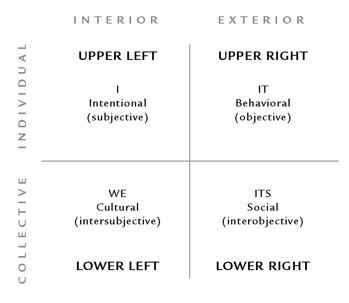 I think this is why Ken Wilbur arrived back at the same point with his four quadrants. 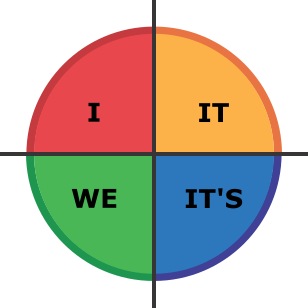 The four Integral quadrants, I, IT, IT’s and WE, and the four classical elements FIRE, EARTH, AIR and WATER. 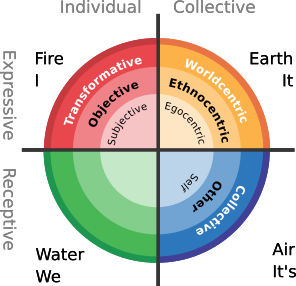 The different levels of Spiral Dynamics can be simplified into three different modes: Egocentric, Ethnocentric and Worldcentric. There are many other ways to describe these modes. 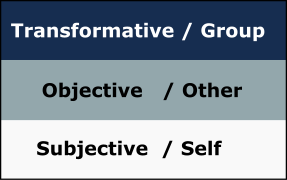 I’ve been calling them Subjective, Objective and Transformative, or using the terms Self, Other and Collective. Although each set of words has a slightly different meaning, they all express the same general shift in perspective. I also prefer to call them modes rather than levels so as to avoid a perception that they are better or worse than each other. These are just different modes, and each needs the other. Mapping the quadrants onto the three modes, produces a matrix of 12 states. These states happen to map very cleanly onto my understanding of the 12 signs of the Zodiac. What I found so interesting when exploring this, was that it showed the Zodiac to be a very clear, emergent system that grew from first principles. There is a huge body of work, of varying levels of quality, that exploring the characteristics of the 12 zodiac signs. By showing that these signs emerge from a simple set of rules consistent with Integral theory and Spiral Dynamics, there are ways in which these different systems could inform each other. These maps allow for a good deal of praxis, taking big, theoretical concepts and allowing some very practical tools to emerge. 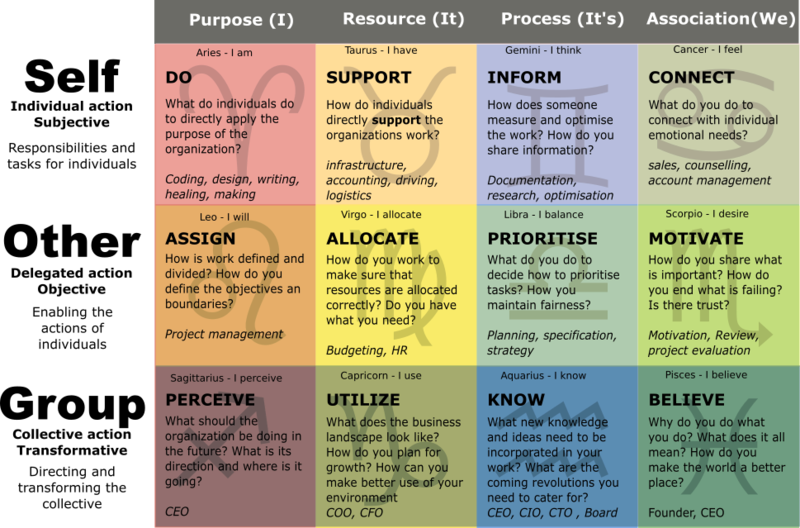 Here is a version of the 12 states in a grid, defining the kind of roles that could exist within an organisation. I’ve got a little more on this exploration in a different article. There have been some really interesting explorations of the AQ/AL map. I’ve referenced a few of them here, I’m sure there are many more. There are going to be many other ways in which we can improve our understanding of these concepts. I’d love to learn of any others.